How to get the fish cooked nicely without the skin (the best part) going all flobby? Place the oven rack about 3-4 inches away from the heating surface. Pre-heat oven Broiler for about 5-10 minutes. Coat the fish, flesh and skin sides, with the oil and sprinkle with salt and pepper. Arrange skin side up on a foil lined baking sheet. 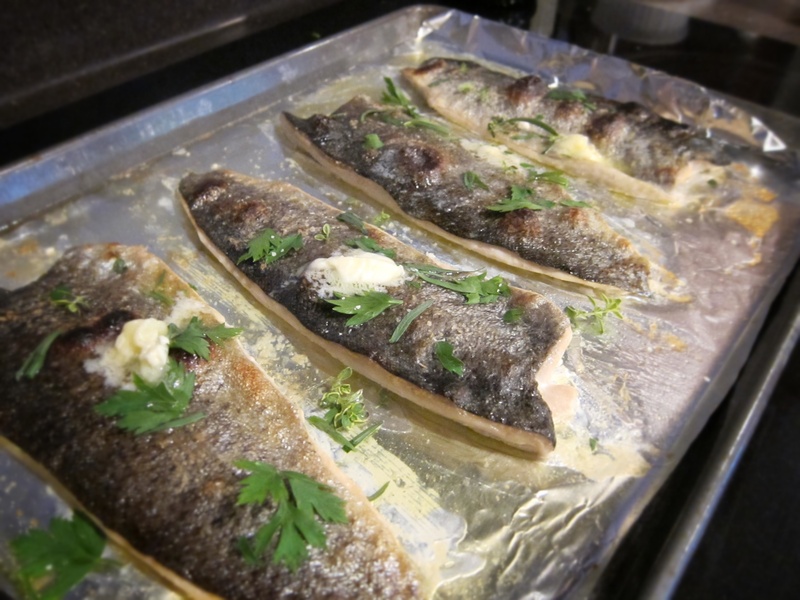 Place the fish into the broiler for about 5-8 minutes depending on the number of fillets and thickness of the fish. Set the timer, don’t wander off, or you’ll have really crispy skin in the form of blacked charcoal. When the skin is crisp and golden take from the oven and tear over the fresh herbs, add a dab of butter onto each fillet and serve with a final squeeze of lemon.